It was in the summer of 1893, July 30, to be precise, that this “learned Brahman Hindoo,” according to the Chicago Record (September 11, 1893) report, with a “fleshy face… an orange turban and a robe of the same colour” arrived in Chicago. This “bright and intelligent” looking man with “very good” English was none other than Swami Vivekananda. He had sailed from India on May 31, 1893, on a long journey to America, to be at the Parliament of Religions representing Hindus. When Swamiji arrived in Chicago, India was a British colony — destitute, battered and demoralised. Years of loot, plunder and destruction at the hands of foreign invaders and then, the shackles of colonialism following that, had brought a once prosperous and affluent nation with strong scientific temperament — the nation of the Vedas, of Panini, Aryabhatta and Patanjali — to its knees. Desperate and distraught, India was looking for a spark. Swamiji provided that spark in the form of his speech to the Parliament of Religions. Through that speech, he also introduced Hinduism, the “Sanatan Dharma”, on the world stage. He talked about how pluralism and respect for all, love and compassion, reason, logic and science were the hallmarks of this great Hindu civilisation. It is a civilisation that is one of the oldest, if not the oldest, continuous civilisations of the world. 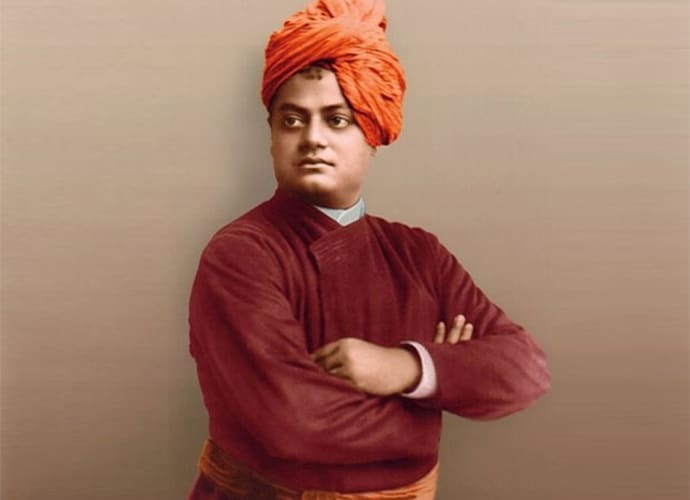 When about 2,500 delegates of the 2nd World Hindu Congress (WHC) will assemble in Lombard, a southwest suburb of the historic city of Chicago, to commemorate the 125th anniversary of Swamiji’s speech at the Parliament of Religions, they will be representing an India today that is very different from what Swamiji had come to represent. The overbearing yoke of colonialism is long gone. A billion and quarter people strong, India today is the world’s fastest growing and the fifth largest economy. Having sent its indigenous Mars mission, on its first attempt no less, and on a fraction of the required cost, India is on the cutting-edge of science and technology. In addition, India is going through a period of cultural renaissance. The vintage socialist Nehruvian model has given way to the more capitalist free market economy. Nurul Hassan’s model of education is crumbling under its own weight and is about to reach its “sell-by” date soon. A new India is emerging — and Hindus are making their mark in this rebuilding. It is against this background that the 2nd World Hindu Congress in Chicago assumes its significance. The Conference, spread over three days (September 7-9), will showcase an eclectic gathering of over 250 academics, authors, artists, economists, politicians and thought leaders. Its 2,200 delegates are drawn from over 50 countries. It is being billed as the “largest gathering of Hindu leaders to date”. The three-day event will feature Plenary and Valedictory sessions and as many as seven parallel conferences on economy, education, media, women’s issues, organisations, youth and politics. Conceived by an IIT Kharagpur engineering graduate Swami Vigyananand, the WHC seeks to understand the challenges facing Hindus globally and collaborate on possible solutions to those. As a quadrennial event, the first WHC was held in 2014, in New Delhi. “Hindus have both spiritual and secular needs. Unfortunately, many of the secular needs have been left for others to handle. The WHC seeks to fill in this very important gap”, say the organisers. This self-centrism is most liberating and empowering at the same time, especially if one is talking in terms of spiritual exploration. However, in day-to-day life, this has led to an extremely decentralised system. Despite the deep sense of belonging to a civilisational nation, Hindus remained, to a great extent, vulnerable. This vulnerability exposed them to foreign invasions, proselytisation and colonisation. The WHC seems to be an attempt to come to terms with some sort of organisation that will help prepare Hindus as a group to confront some of the challenges faced by members of the society. It is also an attempt to self-define an identity, and create and control a grand narrative of its own. The World Hindu Congress 2018 motto, “Sumantrite suvikrante (think collectively, achieve valiantly)” captures that spirit beautifully. The planning for the event had started several months ago. A group of over two hundred dedicated volunteers have been working day and night, many behind the scene, to make the WHC a success. The Dalai Lama will be speaking in the inaugural session. Other notable high-profile speakers include RSS Chief Mohan Bhagwat, Art of Living Foundation Head Sri Sri Ravi Shankar, Chinmaya Mission Worldwide Head Swami Swaroopananda, former NITI Ayog Vice Chairman professor Arvind Panagariya, academician and author professor Madhu Kishwar, Walmart VP Dan Bryant, Vice President of Surinam Ashwin Adhin, film artist Padma Bhushan Anupam Kher, film director, author and Member CBFC Vivek Agnihotri, Makarand Paranjape and author Amish Tripathi of the Shiva Trilogy fame. One of the downsides of such a gargantuan attempt to organise, many would argue, is the fear of losing the defining characteristics and the distinctive edge Hindus have had for over 5,000-plus years. They fear Hindus may become like the others that they are trying to organise against. Those fears, however, seem far-fetched, considering the history of Hindu society which has organised time and again against specific short-term goals. Will this one be any different? Only time will tell.